Assata Shakur, a Black Panther in the 1970s, is alive today and living in Cuba. In Kalungi Ssebandeke’s first full length play, the woman who topped the FBI’s most wanted list befriends a young black Cuban man who is desperate to get to America. Lynette Linton’s production opens with a sprinkling of key facts about Assata repeated over bass-heavy rock in the manner of Rage Against the Machine’s Wake Up. The music has a slow persistent anger running through it. The audience enter the theatre through Assata’s front door, crossing the roughly tiled floor that runs up through the aisles on both side of the traverse stage. Once the play begins we are locked in. Throughout, the door is watched like a hawk, often with Assata’s handgun trained on it, proof that the freedom her student seeks in America is not as simple as he imagines. Adjoa Andoh’s performance as the legendary black revolutionary is engrossing in its detail, playing intelligently with New Yorker Assata’s connectedness to African culture and demonstrating that identity can be a discovered and learned thing, a flame that needs coaxing to keep alive. This undercuts the straightforwardly empowering narrative. 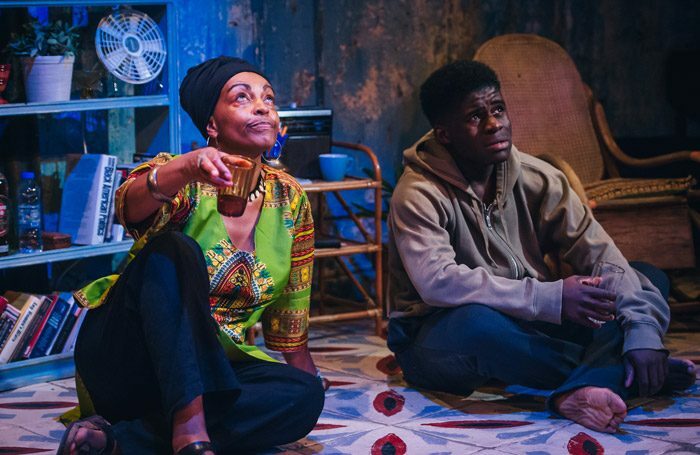 As the student Fanuco, Kenneth Omole gives an exceptional debut performance, growing from cheeky boy to grieving adult in a single blackout, and convincingly steering the piece towards its distressing conclusion. Ssebandeke’s play explores engrossing and rarely staged history, but it boils over all too quickly in its final 15 minutes with a betrayal that requires more room to breathe.